IMPORTANT!!! This page explains how to upgrade by using the installation package. Make sure you are running at least PHP 5.5.3 + Joomla 3.x or above, the max_upload in php.ini is greater than 8MB, and most importantly Joomla is running well, i.e. regular installation of other extensions work flawlessly. Read our system requirement before you proceed. Uninstall the older JomSocial version by going to Extensions > Extensions Manager, select Manage, select JomSocial/Community, click Uninstall. For the third-party extensions, please consult the developer for an updated version, if necessary. 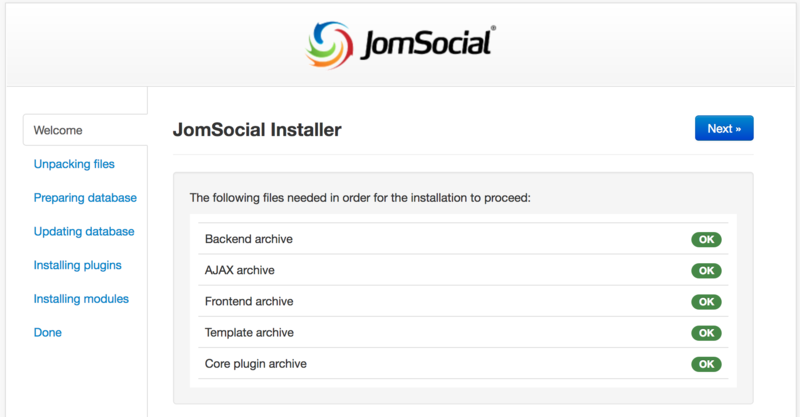 After downloading the Jomsoicial latest package on your site, You need to Open Joomla admin with superuser access, Extension > Manage > Install > Upload the JomSocial zip file and after this you can proceed with Complete Your Installation steps. Hit the big green button from the screen above and first JomSocial installation screen will appear. Make sure all the requirements are met and then click Next. Note: If any of the values are marked in yellow, do not worry, JomSocial will probably still work. If you're concerned that it might not work please make sure your system meet the minimum system requirements. With the new features and enhancements which are part of the new JomSocial releases, there will be a number of new language strings in JomSocial.